We are all guilty of using heat styling tools and the effects that they have on our hair are damaging. If these tools are used without protection on your hair, your hair can become flaky and dehydrated which should definitely be avoided. 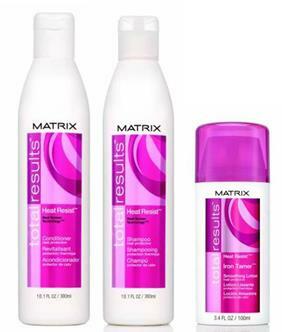 Prime and protect your hair with Matrix’s new ‘Total Results Heat Resist’ range. Consisting of a shampoo, conditioner and iron tamer, these products contain a special formula which includes Xyclose and Hydra Sugars; the Hydra Sugars binding the hair fibre to trap in moisture, and the Xyclose Sugars which coats the hair to form a protective film. Matrix heat resist will give you heat styling protection up to 230 degrees. These products are great for all types of hair and suited for all types of heating tools which will solve all the challenges of heat damaged hair when used as a system. Heat Resist Shampoo (rrp$15): The shampoo cleanses and primes hair for heat styling. Apply the shampoo to wet hair, then lather and rinse well. Follow with the Conditioner. Heat Resist Conditioner (rrp $15): Heat Resist Conditioner has a heat protective formula that helps to retain hair fibre moisture for intense protection. After using the shampoo, apply the conditioner to wet hair. Massage and rinse well. Heat Resist Iron Tamer (rrp $15): Th iron tamer protects your hair pre-blow dry, during drying and while ironing. 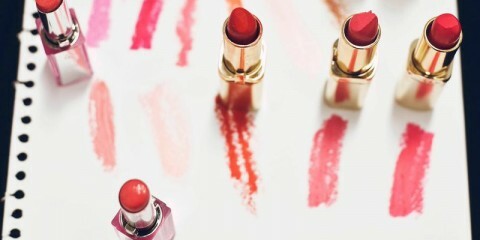 It will also reduce friction which will enhance your blow drying experience. Apply to wet hair after you have used the heat resist shampoo and conditioner. Now your hair is ready to use any heat hair styling tools.